One of the most popular hikes in the Rancho Sierra Vista/Satwiwa open space in Newbury Park is to a small waterfall in the adjacent Boney Mountain Wilderness. The hike is about 3 1/2 miles round-trip from the Satwiwa Native American Indian Culture Center and is a moderate hike that can be done by all ages. Mind you, in recent drought years, there has been not much more than a trickle coming down this waterfall, but it still makes for a good hiking destination. You have two primary options for where to start the hike. You can drive into the Rancho Sierra Vista park entrance on Via Goleta in Newbury Park and park in a lot that is a brief walk to the Culture Center, or you can park at the Wendy Drive and Potrero Road trailhead and add an another two round trip miles to your adventure. The entrance to Rancho Sierra Vista/Satwiwa at Via Goleta, 1 mile west of Reino Road. 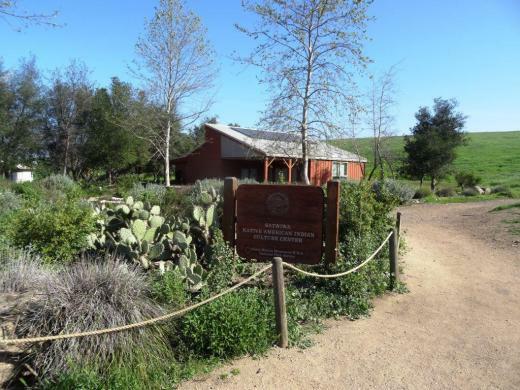 The Satwiwa Native American Indian Culture Center is a small building open from 9am to 5pm on weekends where you can learn about native Chumash items and local wildlife. Next to the Culture Center, you'll see multiple paths, all of which can get you to your destination, but the most direct path is the Satwiwa Loop Trail seen on the left, which crosses through a meadow that can be quite green and beautiful in late Winter/early Spring and dry and brown the rest of the year. An alternate route is on the right of the picture above - the Big Sycamore Canyon Trail (paved road) to the Boney Mountain Trail, where you'll take a left. Satwiwa Loop Trail section that takes you diagonally through the meadow. Seen here when it is nice an green. At the end of the meadow, continue straight up a fairly steep hill, where on the right hand side you'll see the Sycamore Canyon Overlook bench shown below. Hike up the moderately steep and rocky path up the hill behind the bench and you'll reach another fork in the road. If you veer left at this juncture you'll be on the Hidden Valley Overlook Trail within Rancho Sierra Vista/Satwiwa. Stay to the right and you'll be entering the Boney Mountain Wilderness area within Point Mugu State Park. Sign that shows you the Hidden Valley Overlook Trail is on the left. Veering right into the State of California managed Pt Mugu State Park; as you can see, dogs are not allowed in the back country area of the park. This trail is referred to as Danielson Road, named after the last private owner of these lands. The path down into the canyon is seen below (taken from a higher point en route to Danielson Monument). View of the initial section of Danielson Road trail down into the canyon; this is the path you will be taking towards the waterfall. Danielson Road is a bit on the steep side but I see folks young and old walking up and down this section all the time. Seen here in very dry conditions. After .4 mile, you will reach the bottom of the canyon and see the sign above, the final sign indicating you are on your way to the Waterfall Trail. Then you will cross a creek bed, which can have water in it after the rains. The photo taken below in January 2015 shows minimal moisture, making it easy to cross. Some years you may have to rock hop your way a bit over the creek. After you cross the creek, the remainder of the trail to the waterfall is single track. Be careful not to come in contact with poison oak often seen on the sides of the trails. For this reason, I would generally not recommend strollers be taken up here. Soon you will reach the final fork in the road. Go straight and soon you will be at the waterfall. To the right, the Danielson Trail continues upward.